Kitty you made the perfect Fall tea vignette ~ I love the brown transferware cup and saucer, especially that there is a touch of blue in the sky. Is so very English~looking! The muffins look wonderful, I am saving the recipe. Thank you! oh those muffins looks so good and crunchy! Yes, I'll have a couple. Love the teacup and owl. Oh Kitty these sound good! I love the surprise inside! Your pig made me laugh and of course the owl is adorable! Happy October, it's actually cool here this morning, yay! So great to see your post this morning! The pumpkins treat sounds delicious! Love the owl! My sister is an owl collector and I know she would love that. So cute! Enjoy your day! Your muffins look lovely, Kitty. The little owl is really cute and so nice you received him from a friend. I too enjoy brown transferware this time of year. Your teacup is very pretty! Thanks for sharing and have a beautiful day, my dear friend. Hello Kitty, your muffins look and sound so delicious. Thanks for sharing the recipe at Cooking and Crafting with J&J. The muffins look delicious, Kitty. I'll be pinning this recipe! What a cute owl gift you received. I hope you enjoy this first October Monday! Hi Kitty, your muffins look so delicious and the perfect fall treat. Love your gifted owl. He is a darling treasure. Enjoying being outside with our cooler temps is truly a treat too. Love your teacup. This is one of my favorite patterns. Love the colors for fall. Thanks for sharing this recipe. The muffins look delish, Kitty. I love the brown transferware in the fall too. I'm always looking for pieces. Hope you are enjoying this nicer weather we're having. See you later this week on the tour! Kitty - you've done it again - and I have all those ingredients! I gotta try these - yum yum yum. You know - you should ask someone who does it - but I jut LOVE the bloggers who write out their recipes but then there is a button to click to print it - makes it so easy and professional looking. Of course all we need do is copy and print in word - but those one click print dealios are kinda nifty, too. These muffins look delicious Kitty and I'm always looking for new fall recipes that have pumpkin in them. You and your yummy recipes! I do love pumpkin!!! The adorable Mr. Owl made me smile! Your pretty tea setting is perfect for the autumn season from the brown transferware to the yummy pumpkin muffins. Oh, Kitty, these muffins look and sound delish! I will definitely be trying them. Isn't it nice to be able to sit outside and be comfortable? I'm loving these temps and sunshiny days. I have pumpkin! If it just gets a little cooler, I am sure that I could be inspired. Looks like a delicious treat on a beautiful day. I could really go for one of these right now. I love pumpkin. Oh wow, Kitty, these sound delicious!! I really like the King Arthur Flour recipes, don't you? Love the addition of the cream cheese filling here (I love anything with cream cheese). ;) The owl you got from Marsha is darling, and I love your teacup and saucer. I, too, like brown transferware in the fall, and I'd love to have some of those Olde English Countryside dishes. 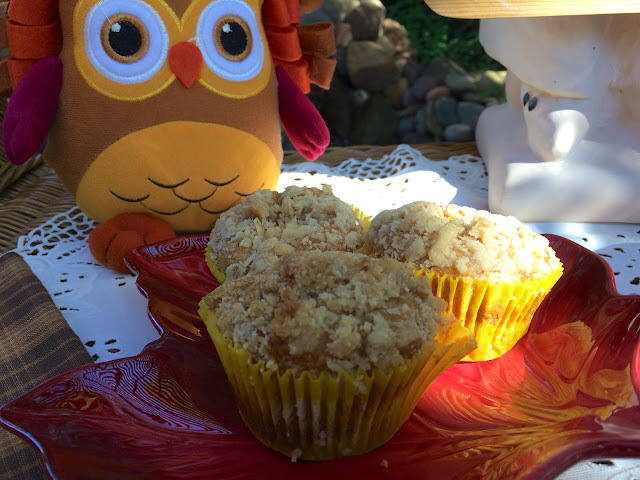 Your Inside-out Pumpkin Muffins look delicious, Kitty, and what a beautiful fall setting to eat them in! Kitty, I'm popping in. My computer is broken so I'm just using my phone (and sometimes my iPad works). I am hoping to buy one in the next month or so. Until then, email and snail mail will have to do. Btw, your muffins look delicious! That little owl is just too stinkin' cute for words & the look on your pig is priceless, Kitty! The "Inside-Out Pumpkin Muffins" look soooo enticing...I've copied down the recipe & hope to try it as soon as it gets cool enough to turn on the oven. Thanks for sharing! Your little owl is darling, my friend. Did Marsha make it? Hi Kitty ... the Inside-Out Pumpkin Muffins look so good. Maybe I will try them for Christmas. Love your outside by the waterfall ... nothing more relaxing. Your owl is so cute Kitty. A beautiful fall setting and the muffins sound delicious! wish I had one right now. :) Thanks for sharing the recipe with SYC. Kitty, how I would love one of your pumpkin muffins with my cup of coffee this morning. I love your owl, and will start decorating for fall once we return from my niece's bachlorette party this weekend at the Finger Lakes wineries as the beautiful foliage will inspire me to decorate. Kitty, your centerpiece is really pretty. Thanks for sharing the muffin recipe from King Arthur. It's on my to try list. What a cute pig and the owl is so fun! These muffins look delicious. I am sure they are all gone by now! What a fun post Kitty and I thank you for sharing and linking. Such a sweet tea time today! I like your teacup, I have a set of them and they are perfect to use for fall! Thank you for the muffin recipe! Looks and sounds delicious! 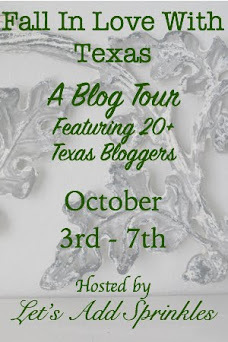 Also I wanted to tell you I saw your beautiful fall decorated home on the Texas Fall Tour! I just loved it! Your are talented not only in cooking and baking but decorating, too! Beautiful! These look divine! Thanks for sharing at Monday Social. 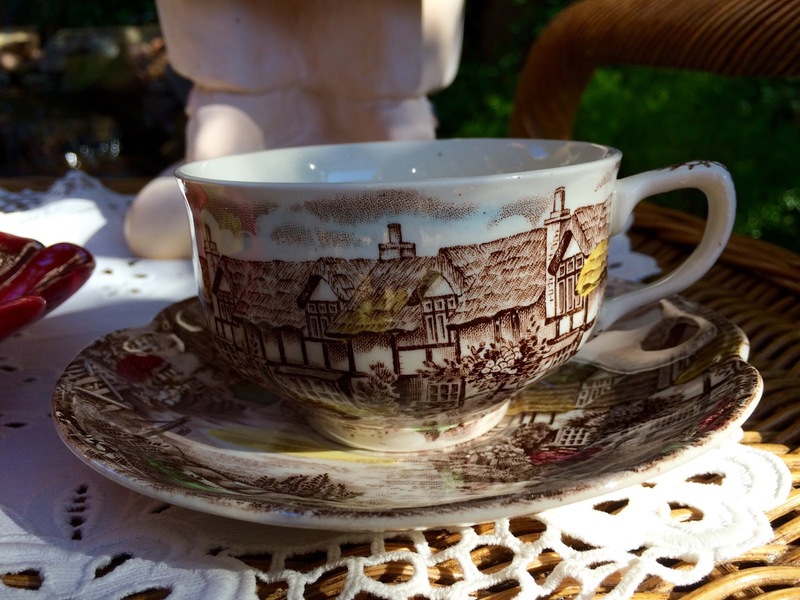 One of my favorite transferware patterns! The muffins look delicious...but I'd have to pass them up with the cream cheese...allergic. But they look so delicious! I love your pig and owl. So cute! Thanks so much for linking to Tuesday Cuppa Tea! Just got back from break and catching up! Happy Fall to You Kitty! It is good to see you back after your travels, I always miss you when you are not here. 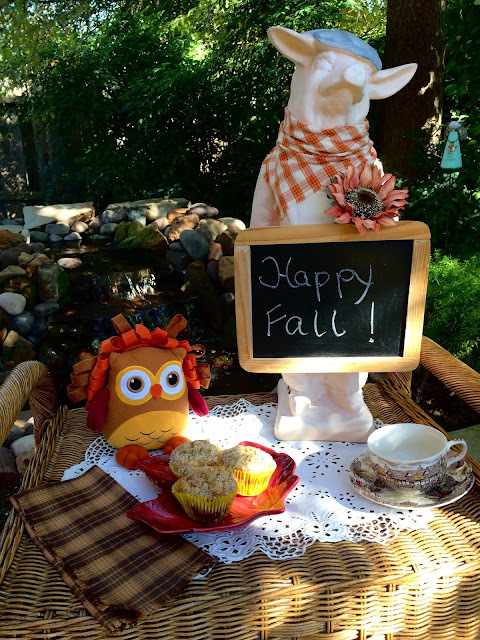 Thanks so much for sharing your awesome Pumpkin Muffins with us, just perfect for a fall afternoon tea. Hope you will come back to see us at Full Plate Thursday real soon and have a great week! Oh my goodness, these look amazing! I'm a certified pumpkin everything girl this time of year! I usually would've baked a few loaves of pumpkin bread by now but due to my diet, I have not baked one!! I'm really missing it....your owl is adorable. What a sweet gift from your friend! Another pretty teacup too! I enjoy your little tea parties Kitty! Enjoy your fall days! Love these recipes, truly addictive and tasty.